2/7/2011Share this story on Facebook! This isn’t the first active role Ithaca College has taken to promote equality and individualism. In Fall 2010, dozens of students, faculty, and administrators participated in a campus-wide “It Gets Better” video. Ithaca College Reminds Students "It Gets Better"
Ithacappella and Premium Blend’s latest venture has even garnered some celebrity support. Modern Family stars Eric Stonestreet and Jesse Tyler Ferguson have both lent their voice to The Trevor Project and encouraged people to purchase the song. Stonestreet even tweeted about it! To find out more about The Trevor Project, Ithacappella, or Premium Blend, check out their respective sites below. 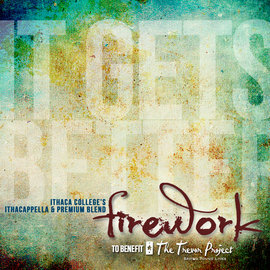 Ithacappella and Premium Blend reached out to The Trevor Project with an idea of an a cappella twist on raising money. Jimmy Knowles, Ithacappella's Vice President, said some kind of collaboration with both Premium Blend and a charity was a long time coming. "The Trevor Project is something that I think this campus in particular has paid a great deal of attention to, partially because of how mainstream it has become and because we have such an open and accepting campus community," Knowles said. The two groups considered writing an original song, but felt Perry's ballad best represented the mission of The Trevor Project. "'Firework' is really a song that is about accepting who you are, believing in yourself, not being afraid to show your true colors, and being honest with yourself and everyone around you," Knowles said. The two a cappella groups debuted the song at Ithacappella's Block II concert on campus last December, and plan to perform it together at future concerts. But why wait until then to hear it? Head over to iTunes now to purchase their rendition of the smash song.